Is bad cholesterol really bad? I’ve posted a couple of times about my husband’s high LDL level and his attempts to lower it through diet and exercise. I’ve also said that because he doesn’t have any other risk factors for heart disease, we aren’t too worried about it. But the engineer in him likes the challenge of seeing how low he can get his LDL. When I saw this recent YouTube video, however, I had to ask him to watch it. What if everything we think we know about LDL levels is wrong? What if so-called bad cholesterol isn’t really bad after all? 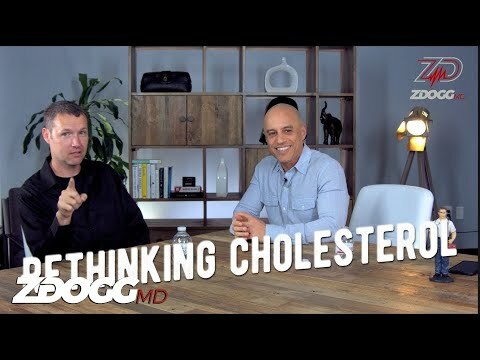 The video is from one of my favorite healthcare resources, ZDoggMD. He’s a hospitalist out of Las Vegas and has been leading a movement through social media and other avenues to restore the sacred doctor-patient relationship. In other words, his goal is to stop Big Pharma, the insurance industry and the government from determining how physicians should do their jobs, and how patients should behave. The interview is long, but well worth watching, I think, if you have high cholesterol and are on statins. Or your doctor is encouraging you to take statins, like my husband’s doctor is. What he discovers through experimenting with his diet and having daily LDL levels drawn for a period of time is that the human body’s energy delivering system is both more complex and more elegant than we might think. He suggests that an annual lipid profile does not give us the information we need, because it appears the LDL level can change drastically, even daily, depending on the fat content in our diets. At least it did in his lab tests. Specifically, he noted an “inverse” relationship: the more fat he ate, the lower his LDL level. If there’s anything that I wish everybody knew, it’s that they should not make a life-long medical decision based on a single, annual cholesterol test. Dave follows a ketogenic diet. Keto diets are very low carb and high fat, with a moderate amount of protein. You really need to watch the video for his explanation of how the body utilizes and stores carbs and fats. It’s more than I want to get into here. My takeaway from his results, however, is that my diet might be out of balance and I’m taking a closer look at what I eat. For the last few years I’ve followed Michael Pollan’s advice: Eat food, mostly plants, not too much. Whole grains, fruits and many vegetables, however, are high in carbohydrates, despite their other health benefits. I try to limit the fat in my diet to healthy fats such as olive oil. I eat small quantities of lean meat, eggs and dairy. But for the last year I’ve been exercising a lot more, and I’ve noticed being more tired and sore. Is my body not getting enough fat and protein to repair itself and maintain a higher level of activity? Will we see future research on this topic? Doubtful. Most research is funded by the companies that make statins and other cholesterol-lowering drugs. It’s unlikely they will want to pursue a hypothesis that would put them out of business. Informatuve article! I have heard for years not to join the statin craze. And I believe in the Keto diet- have eaten that way and done well. Would like to have the self control to keep eating that way. I felt better. Chocolate cake keeps getting in the way! !